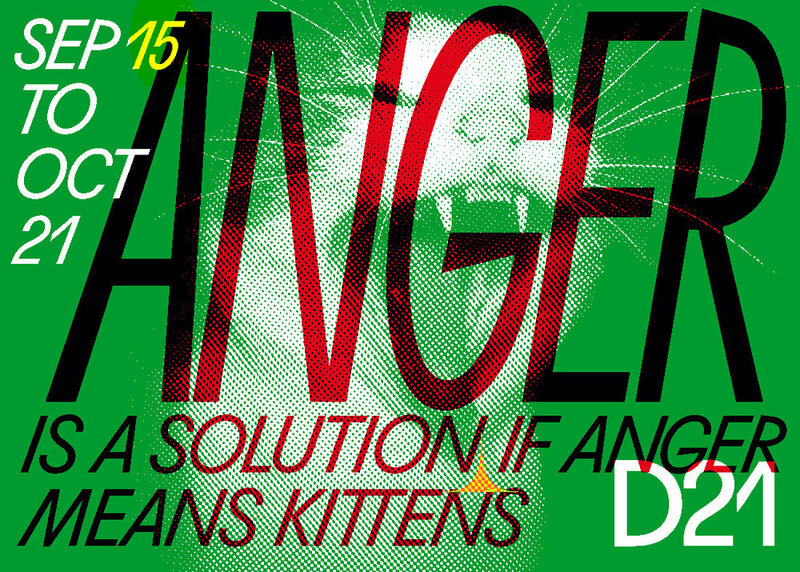 The project Anger is a solution, if anger means kittens examines manifestations of anger, frustration and exhaustion in post-digital, late-capitalist societies. If reality oscillates between disaster and satire, how one can deal with anger on an individual as well as on a social level? From that perspective anger appears as a tool to transform feelings of refusal, revenge and powerlessness into individual and collective forms of agency. How to use absurd images of censorship, oppression and right-wing populism against themselves? What might be the future of anger in post-revolutionary, post-democratic societies? Apathy, escapism, depression, irony or excess? Can anger be a solution? Could kittens be as well? 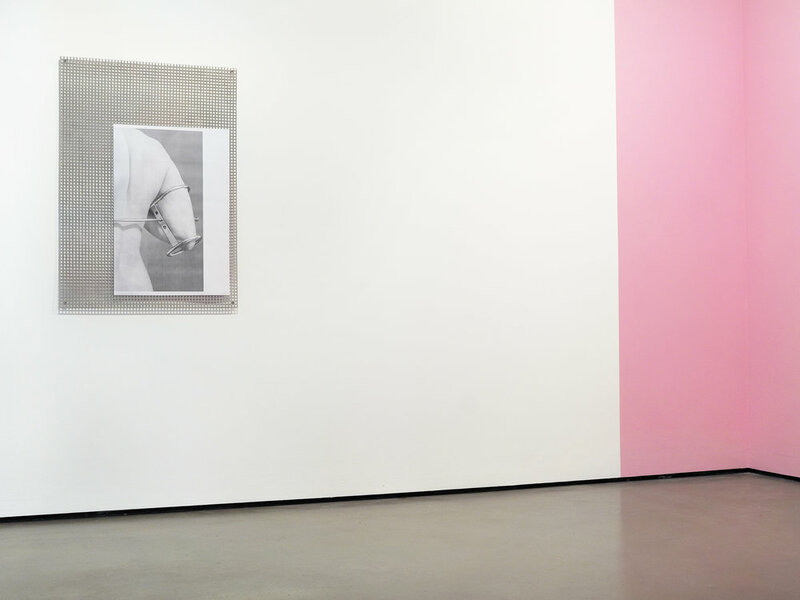 The exhibition opens with a series of cat collages by Lara Ögel that mimic cat memes circulating in the digital sphere. Besides pointing out the recent mass use of kittens and cats in social media platforms, Ögel’s collages also reminds us the absurdity of an incident during 2014 elections in Turkey that got a lot of distracting media attention. After an electricity cut during vote tallying, the government accused a cat for jumping into a transformer unit. The event caused an enormous rise of satiric cat content in the social media. Meanwhile the sound installation of Vera Drebusch produces a soundscape of protest. For her work Drebusch used recordings of chantings that she collected during a march in front of the Trump Tower in New York City two days after the 2016 presidential elections. The chantings appear as an ungraspable echo of marginalized voices, which hint to the universality of resistance – precarious in their ephemerality, but proving constancy as ever repeating sounds through history. With his work Machine that tickles the wall (2013) Ali Miharbi examines technology, power and affect in a broader sense. The small mechanism can be seen as a humorous allegory of the ambiguous relationship of state and citizen, or any relation in between: an impulse that is repeated over and over again can be interpreted as an negligible trigger, as an annoying disturbance or even as a provocation leading to unforeseen reactions. Miriam J. Carranza uses pieces of sport equipment, floor mats and foam rollers, to create an immersive environment for a 3-channel video installation. The films deal with concepts of strength and weakness, circle around new definitions of winning and losing, approach the phenomenon of dissociation through constant distraction and search for possibilities to transform resulting feelings of anger, frustration and powerlessness in political thinking and acting. 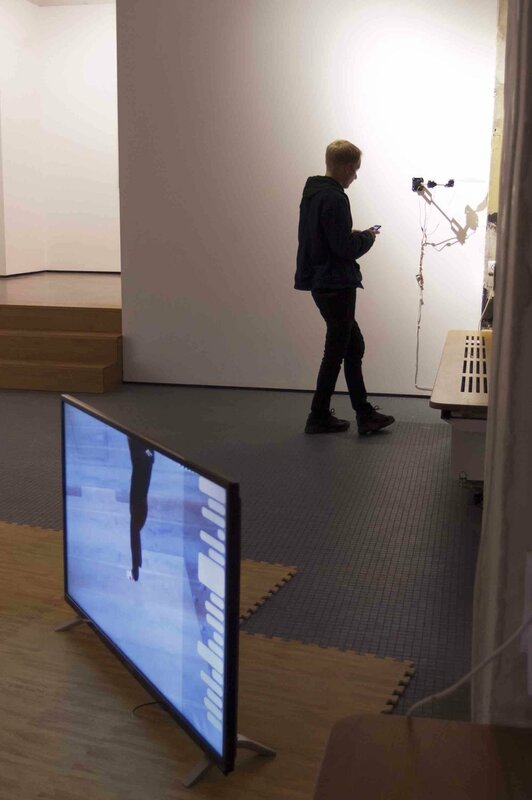 25m2 of fake-wooden puzzle sport mats and camouflage fascia roles offer a hang-out lounge to rest and watch the 3 videos‚ “Cosmic Dissociations (Express)”, “SPEAKING KNIFES 4 HERKULES”, and “Parasitic Passivation” by Miriam J. Carranza. Her investigation involves rethinking concepts of strength, productivity and effectiveness, the phenomenon of cosmic dissociations triggered by constant deflection, and the search for transformation of directionless anger, frustration and powerlessness into clear political thinking. Using a compilation of video, photography and plaster casts – Olga Holzschuh investigates physical inscriptions and impacts of power and powerlessness on the body. Through the exploration of gestures of anger and escapism in the context of digitality the work reflects upon the search for solution/salvation and upon tools for self-help meandering between realism and escapism. The video work Neighborhood (2016) by Line Finderup Jensen recalls the notion of passive aggressiveness, an atmosphere that dominates the microcosmos of a claustrophobic suburban environment in Denmark. Her work derives from an examination of affect theory, especially from Sara Ahmed’s framework of “happy objects”. Based on a research on the history of the bathroom the works of Mary-Audrey Ramirez create a space for “emotional hygiene”. Referring to physical gestures of fury and escapism, her objects invite everyone to a daily routine of letting off steam. Berkay Tuncay´s flags play with the aesthetics of activism and digitality, dealing with symbols connected to the shared feeling of being lost in the digital sphere. The games by anna anthropy, “Gay Cats got into the weird weird woods” and “Get ‘em hard” are examples for how the queer game community challenges the heteronormative, misogynist games industry. anthropy is a queer game developer that started the so-called “Twine revolution” by providing the software as well as the philosophy that empowered people to developed their own games. The community growing out of this was attacked some time later by a massive and violent harassment campaign known as Gamergate. The strategies of intimidation used by trolls of Gamergate where later said to be the first “rehearsal” of the Alt-Right campaigns during the elections in 2016. anthropy’s games can be seen as queer alternatives to commercial game culture that subvert conventional narratives, competitive mechanics and sexist representations. Anger is a solution if anger means kittens was realized in the context of “Curator’s Lab” as part of the D21 annual program “Emotional States” focusing on the politics of emotions. 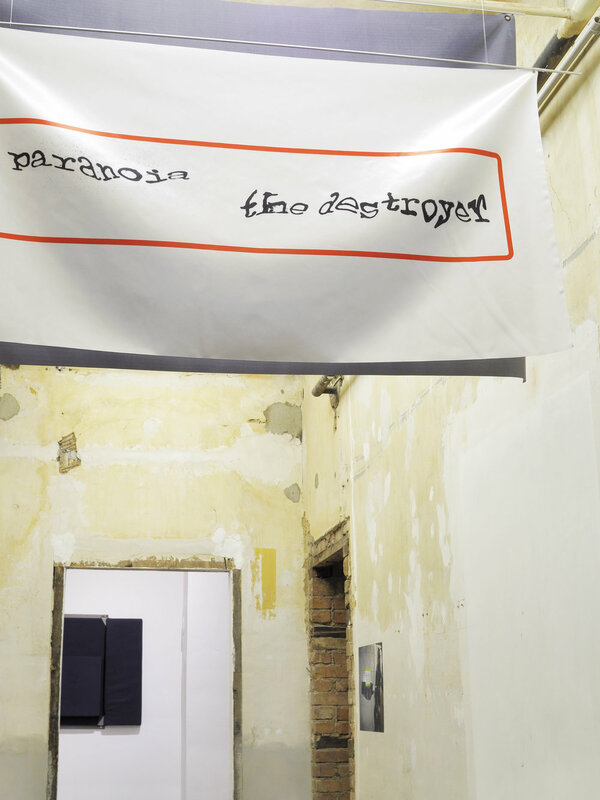 The exhibition is a curatorial collaboration between Eva Liedtjens, Nada Schroer from Germany and Collective Çukurcuma curatorial team (Mine Kaplangı, Naz Cuguoğlu, Serhat Cacekli) from Turkey. Nussbaum, Martha Craven: Anger and forgiveness: resentment, generosity, justice. New York: Oxford University Press, 2016, S. 6.